These are four command bases for HQ's or CO's (Commanding Officers) in the game Future War Commander. I have not yet finished the sand base or the details which are mostly undercoated. 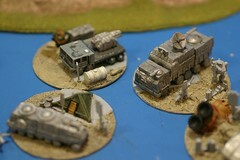 The Vehicles themselves are Battletech and Ground Zero games and are in need of a coat of paint. 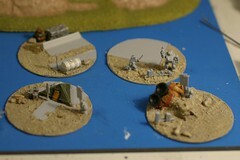 I like the idea of putting a mini diorama style base together on these 40mm bases I cut from plasticard. Once complete they will look significant enough to be commanding officer units. Here are some shots of the bases with and without the vehicles. The additional green hut is a 6mm scale field tent from Ground Zero Games (GZG) and the little walls are from Games Workshop epic (my bits box). The extra concrete textures on the bases are plastic which I have cut to fit on the base. The base with the field tent also has a set of three dustbin's (trash or AKA garbage cans). These are from Langley Models in Crawley, West Sussex - UK and are from the small scale railway models they make. Trash Cans: Langley Miniature Models N scale "Dustbins" as the brits call them. Other small walls and concrete looking floors: Textured Plasticard (can't remember the brand). Small crashed Spaceship: Off cast of Battletech space ship from Ral Partha Europe. Tiny Mecha: Visible one is a Votom from GZG 6mm range. 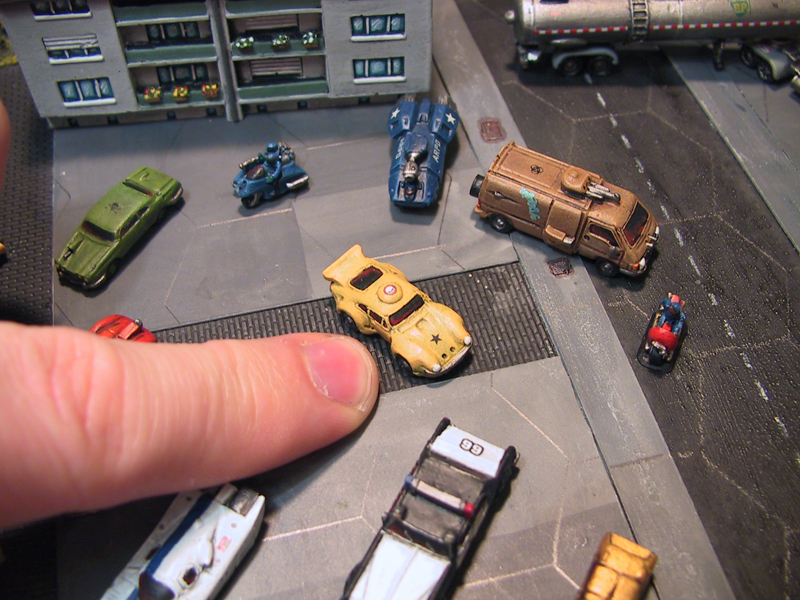 The other mecha with tracks which is not clear in the photo is from Germy's 2mm scale sci-fi from GZG. People: Two GAmesworkshop spacemarine leaders - I wanted the flags to signify the base being a CO or HQ. Other bits of Plasticard rod used to make edges to the concrete areas (textured plasticard). The textured sand is actually "Pumice Gel" a base material that comes in a pot that you just paste on. The pumice is very fine in texture so you get a good scale from it and can build it up a bit around the items placed on the base, rather than just using sand which does not build up very well. The pumice lets you sculpt it a bit when loaded on and reduces the time taken to create a nice base texture. They look nice. Am planning a move to FWC soon so will keep an eye on your blog for ideas. PUMICE GEL.. I forgot bout that. I was using GW fine sand from the starter box, very good.. 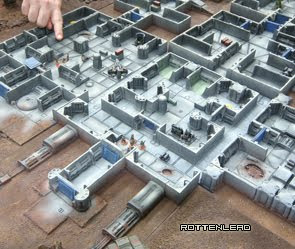 But then got some army painter fine sand, and it's a bit big. I gotta get some pumice gel for my next batch of figures! Brilliant modelling and painting here. I want to do a novelty 6mm skirmish kit one of these days. @Spacejacker: Thanks for the note. I have had the pumice for years, it lasts forever, worth looking in art stores for it. 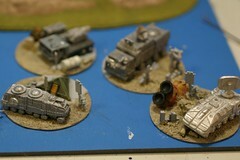 I did once see some at a wargames show but it was not the same quality as the art shop stuff.